Market research online surveys are everywhere and executing on them well takes expertise. To learn some of the finer points that you should be knowledgeable of when headed into the setup and execution of an online survey, check out our free eBook “The Insider's Guide to Successfully Using Market Research Online Surveys”. Multi-Channel - Deployed via web, mobile, kiosks, email, etc. You are going to make countless decisions in the process of executing market research. It is important to incorporate the proper design aspects, research process and recruitment techniques to make your online survey a success. At Communications for Research, we program and run hundreds of market research surveys each year for marketing agencies, B2B companies & B2C companies. In fact many of our current online survey clients reach out to us because the DIY solution they thought would solve their market research problems is more work than what was planned. By hiring CFR, you can fine tune your market research survey design, have impeccable quality in survey programming and be genuinely setup to succeed on your analysis and reporting. With our secured website hosting and database e-mail services, you’ll feel safe knowing your survey is actively maintained and updated. 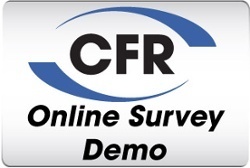 CFR’s entire online survey process is a high-quality experience for both you and respondents. Rebuild a web store as a survey and have participants complete multiple tasks in order to see a heatmap of where they were clicking. Ensure that the code book matches a prior survey for simpler and more effective analysis. Once the survey is coded, all survey projects are tested by two separate individuals in addition to the project manager. One individual focuses entirely on survey logic and quota testing while the other individual checks the wording of every question. Our internal teams and standards produce extremely high quality online survey output for our client to review the first time they receive a survey link. Then through our experience recruiting through phone calls and email communications, we make sure that your survey reaches the right respondents. Ready to Use Online Surveys Successfully?